A trellis is an essential structure that supports heavy and weighty grapevines as they grow. The Ultimate Guide to Grape Growing states that grapes grow on a vine and need a trellis to grow and spread. A trellis raises grapevines off the ground so they receive the maximum sunlight and air circulation necessary for healthy produce. 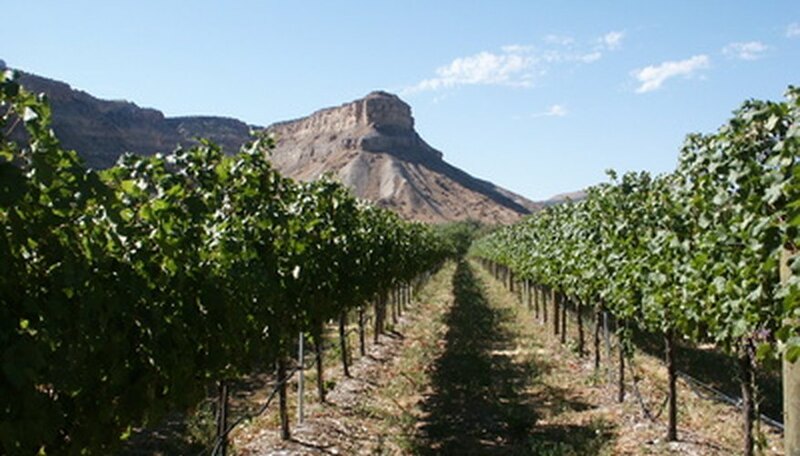 Whether you grow a few grapevines in your backyard for domestic use, or own acres of land specifically for commercially produced grapes, trellising of some kind is mandatory. Newly planted young grapevines will benefit from staking. Insert a wooden or plastic pole or stake at the base of your grape plant before you construct a trellis to support it and encourage the climbing tendrils to grow upward. Keep the stake as high as you want, but build a taller structure such as a trellis when the vines cross the top of the stake. Paul Domoto, in "Constructing a Vineyard Trellis" suggests using an 8-foot tall, 4-by-4 piece of pressure treated lumber and heavy gauge wire to build a sturdy trellis for a single grapevine. Space grapevines 8-feet apart if you are trellising several vines. Drill holes near the top and bottom of each board, and stand them in a straight line in 2-foot deep holes in the ground. Insert two lengths of wire, one through the top holes of all the poles, and the other through the bottom holes. Extend both the lengths through the outermost posts and wind each length of wire several times around two screws attached there to hold them in place. Use three-quarters to 1-inch wide PVC pipes with corner fittings to construct a functional yet decorative grape trellis. Keep your trellis up to 8-feet tall, and insert the corners of the PVC pipes at least a foot deep in the ground to hold the trellis securely. Make sure you include supports such as rebar stakes at the sides and in the middle if the trellis is longer than 6-feet to prevent it from toppling over with the weight of each grapevine. Enhance interest and appeal in your backyard by creating a grape trellis with privacy lattice sheets. Available in most hardware and home improvement stores, these sheets are made from wood and plastic and easily available in most hardware and home improvement stores. They are sold in different shapes and sizes including 2-foot lengths commonly used to support Concord grapes. Select plastic privacy sheet for hot and humid climates as it lasts longer than wood. The Black & Decker website suggests you construct a wooden frame for your privacy sheet by using 2-by-4 lumber. Make sure it is at least 2-feet wide, 6 to 8-feet tall and covers a length of 6-feet.